I set out this morning to blog the general status of “exclusive remedy” in the workers comp system, but I’ve been distracted by a specific case which involves an injury to a professional athlete. I will return to the more general ramifications of “exclusive remedy” in a few days. Greg Lotysz was a lineman for the New York Jets. In July of 2000 he sustained an injury to the anterior ligament of his left knee while blocking another player during pre-season practice . Pursuant to his NFL Player contract and the players’s Collective Bargaining Agreement, he received care from the Jets’ Medical Department. Lotysz underwent surgery and post-surgery rehabilitation under the care of the Jets’ physicians. A post-surgical infection resulted in permanent damage to his knee, which in turn brought a premature end to his football career. 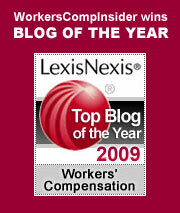 The fact that Lotysz’s claim falls under the workers compensation system is not all bad. While he cannot sue the doctors for malpractice, he is eligible for indemnity benefits (admittedly chump change compared to a professional lineman’s salary) and for lifetime medical benefits for any treatments related to the injury (given the apparent permanency of his disability, this could turn out to be a significant benefit). It is important to note that hospitals and similar medical facilities that treat both the public and their own employees may not find the courts so receptive to the “exclusive remedy” approach. For the most part, when hospitals treat their own employees for work related injuries, they become a third party vendor. If employees are unhappy with the treatment, they usually have the option of pursuing tort remedies. The main difference, I would guess, is that the hospitals routinely treat the public, while the “team doctors” have a more limited practice. The Lotysz opinion is binding only in New York. It’s possible that under similar circumstances other states will conclude that team doctors are indeed third parties and thus liable to lawsuits for malpractice. In the world of professional athletics, the medical profession is intricately involved in what from time to time may be ambiguous circumstances. With such enormous sums of money at stake, owners may pressure doctors to rush star athletes back onto the field. Permanent damage may result. Under these circumstances the player will certainly want to pursue a tort remedy. Whether this option is available to the athlete remains a state by state situation.